With so many options, Alpena is the perfect destination for fishing enthusiasts. The multitude of inland lakes and the Thunder Bay River system provides plenty of options to increase your chances for success. Alpena waters have been featured on many popular sport fishing shows highlighting the healthy and plentiful fisheries. Most recently, Alpena welcomed its third visit from the Outdoor Channel’s popular Major League Fishing television show. 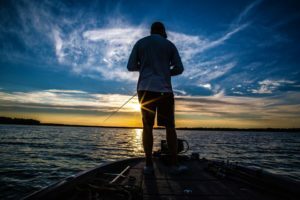 Three seasons of this top ranked program were filmed in Alpena, validating Alpena as one of the premier bass fishing destinations in the United States. Paul Gohlke, throwing bait on Long Lake, courtesy Steve Jakubcin. Thunder Bay River is one of the largest river systems in the state of Michigan. The 75-mile long main branch, and accompanying north and south branches, are known for their clear water and beautiful natural scenery. A number of dams built along the river have created interesting habitat for many different fish species making this one body of water you will want to consider when fishing the Alpena area.